OUCH! Great shot! very creative! "Great Job" from the "Great Job Baggie"! I love shots that are humorous and light-hearted. This is VERY original. Did you draw blood at some point? LOL. The hand drawn circle is just brilliant. The imperfect drawing on the hand (unevenness of the circle, and crookedness of the lines in the circle) are very nice. The tonal quality of the background allows your subjects to stand out. Did you dodge and burn this one? If so, then maybe the one thing that I'm seeing in here, that I don't like, maybe a result of that. What that one thing is, is the lines on the hand and fingers seem to be a bit blackened. That could just be me, however, but I find it a TINY bit distracting. I'm upping your score from an 8 to a 9 after second look. Just because it's funny and original. Ouch. Interesting idea, well done. 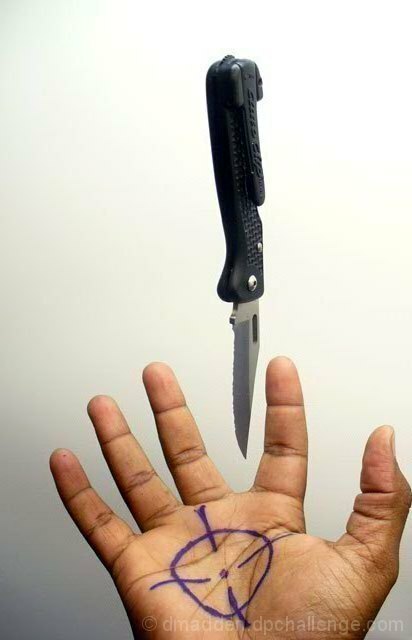 Talking from a person who is afraid yet drawn to knives, this image scares me a bit, its nicely done. But the fact that the knive, seemingly, would not hitt bullseye bothers me a bit and also the shadow/dirt on the thumb. Oh so well done. Clever idea and nicely executed. Ouch! 10. You weren't a Boy Scout were you. ;^) Funny idea. Somehow the split fingers between the index and middle, adds to the image in a good way. Thumb is a bit tight to the right. The knive isn't quite as sharp (no pun intended) as the hand - it's a little blurry like aperture wasn't deep enough to get it all in focus. Looks off-target (hope it was for your sake ;-) Cool idea. Proudly hosted by Sargasso Networks. Current Server Time: 04/23/2019 01:55:48 AM EDT.